As part of an ongoing effort to support local food-growers, Salt Lake City—in partnership with Urban Food Connections of Utah—now offers a second round of microgrants to area farmers looking to expand operations in a sustainable manner. 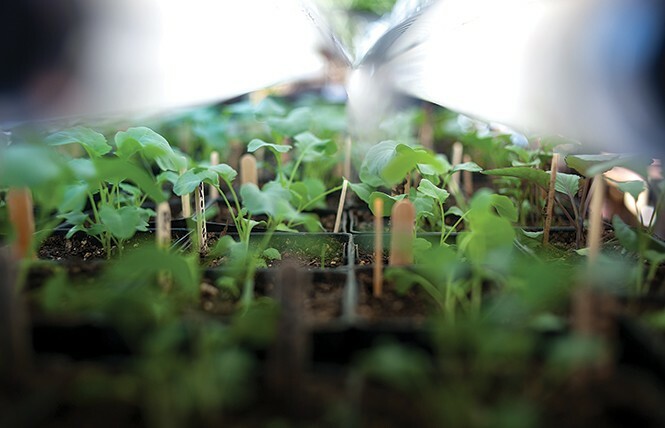 In February's first round, 33 applicants submitted requests for more than $130,000 in microgrant funding; recipients include BUG Farms, Earth First Organix, Blue Spring Farms and Pyne Farms. The deadline for the second round of funding is Aug. 25, and grants will be awarded by Sept. 30. Visit slcfarmersmarket.org for the application and additional info. Jonathan LeBlanc, the new executive chef at Stanza Italian Bistro & Wine Bar, gets a special chance to show off some of his new dishes as part of a beer-pairing dinner with Fisher Brewing Co. on Thursday, Aug. 17. The four-course menu includes braised pork belly with Yukon potato purée, Fuji apple butter and parsnip chips; gulf shrimp and tasso ham with okra, pickled red onion and crystal red hot sauce beurre blanc; pomegranate lacquered duck breast with foie gras ravioli, sweet potato butter and duck fat potato crisp; and butter pecan pound cake with toasted coconut gelato and praline brittle. Fisher brewers will be on-hand to discuss the qualities of the paired beers that make them the right match for each of the dishes. Dinner begins at 7 p.m.; cost is $85 per person, including beer pairings. Call 801-746-4441 for reservations or visit stanzaslc.com. Jazz fans longing for a new venue, your wish has finally been granted—along with a chance to dine while listening. Avant Groove Jazz Club and Martini Bar opened on Aug. 10 at 122 Pierpont Ave. in downtown SLC, with Elastic Jazz Quintet—featuring club owner and saxophonist John Vecchi—serving as one of the house bands. In addition, the location features an extensive menu of new American, Italian and seafood including small plates, salads and flatbread pizzas. Visit avantgroove.com for more details. Quote of the Week: "Blues is to jazz what yeast is to bread. Without it, it's flat."